WOMAD, or World of Music and Dance, is about people together and introducing them to music they would likely have never heard before – certainly not on the top 40 charts anyway (or whatever it is that we typically measure ‘good’ music by). This four day festival experience, which takes place in Adelaide’s beautiful Botanic Park and is celebrating its 20th year in Adelaide, also features a Taste the World cooking area, a Kids’ Zone, a Healing Village, stalls selling ethically/sustainably made clothes and products and promoting social justice campaigns, and an array of foods and drinks from the world over. It is a breath of fresh air in the often stifling Australian music festival scene. For a start, WOMAD allows children under twelve free entry and, to a large but not exclusive extent, attracts an ‘older’ crowd. So you’ll find a diverse mixture of baby-boomers and babies, uni students and corporate weekend warriors, tweens, preteens, whatever else goes in between – all down to your average Jane and Joe and their 1.9 children (and all linked, it would seem, by a desire to ‘go hippy’ for the weekend and don the fishermen pants). Which means, happily, that the festival is not overwhelmed by drunken teens and twenty-somethings. Yet let’s not be forgetting the real point of this festival: the music. When you wander from one stage to another to find sounds from all corners of the globe, enjoyed and celebrated by people all over the globe, nothing confirms more the idea that music is the one language that needs no translation. Yet this strength is also perhaps a challenge – namely, that so many of the artists featured at WOMAD are unknowns to the average Adelaide festival go-er. And with such pricey tickets, it can often take a leap of faith to attend something that seems like a bit of pot-luck with more than a few hippies thrown into the mix. Yes, it might seem like this from the outside. Indeed, it had done to this reviewer, who, before last year, had never attended a WOMAD before, despite hearing the tales from many a devotee. Well, now she is here to urge you to take that leap of faith – you will never find another festival quite as relaxed, quite as atmospheric, quite as welcoming, as this one. Below are a selection of bands that may or may not have been the best things going at WOMAD this year – but they will certainly give you an idea of the diverse range of music that is on offer. Starting off with a guitar shredding opening, it’s no wonder that Melbourne locals Blue King Brown were introduced before their set as “Carlos Santana’s favourite band at the moment.” They would also have to be labelled as your token Lefty activist band. Their stage set-up included a select few world flags, including the Chilean, Brazilean and Australian Aboriginal; it was clear that this band had world issues on its mind. During the second song, the singer took a brief pause to acknowledge the Kaurna people, who are the traditional indigenous inhabitants of the Adelaide area. This was met with applause and cheers by the crowd (the thought, ‘of course it was’ comes to mind, but just because one might expect such a reaction from the WOMAD crowd really shouldn’t detract from the admirable reaction itself). More cheers were to be had – though, need it be said, for a completely different reason –when the lead singer, a feisty-looking young woman with an abundance of dreadlocks and blue eye-makeup you could see from a hundred meters away, went into an a cappella rap which ended by reminding us of the genocides in Tibet and Papua New Guinea. For such an upbeat band that infuses elements of latin, ska and soul styles, they did not shy away from some heavy subject matter. It might be argued that what Joanna Newsom was to WOMAD last year, Scottish folk/country – and not the other way around – musician Eddi Reader was to this. (Only, Reader was fortunate enough not to be set upon by freakishly large moths, as was Newsom’s terrifying lot). Her powerful, lilting vocals, though not as idiosyncratic as Newsom’s, were not afraid to explore the peaks and troughs of the human voice’s capability. To accompany her compelling musicianship – she also played on accordion and guitar – was a charming manner to match. Before starting into the beautiful ‘My Love Is Like A Red, Red Rose’ (which was written by Scottish poet and national treasure, Robert Burns), she had a little quip at the ready – “Did you hear about the Scotsman who loved his wife so much he nearly told her?” Naturally, the crowd, made up of a large proportion of couples curled up in each other’s arms, was quite taken with this jest. Introduced as a fusion of genres – traditional eastern, classical western, hiphop, jazz – this next band included violin, cello, double bass, tablas (Indian drums) and a vocalist trained in the traditional Indian style. It was hard to know what to expect from Picture Box Orchestra. It would certainly have been hard to expect how utterly beautiful, how exquisite, they were. Their second song, translated as ‘Night’, could well take the title for the Best, Yet Most Under the Radar Performance for the entire event. Played in the night as it was, against a backdrop of trees lit up in green and purple, and with moths flickering in and out of the spotlights, it told of being surrounded by the night and not being able to see one’s lover, of being alone with the darkness. Not to keep themselves in the melancholy box though, the band next performed a song written by the violinist after she had taken her niece to see the filmic adaptation of Roald Dahl’s Fantastic Mr. Fox. It was called ‘Mr. Fox’, and featured an impressive display of rhythmic hand-clapping and chest beating. Then, just to turn those tables round a little further, a later song was played entitled ‘Benazir’, told from the perspective of the Pakistani politician’s father. At one point during the song, bubbles started floating over the heads of the seated audience, their precious fragility a reminder of the late Benazir Bhutto’s premature demise. Now here’s something to make you smile, nay beam with delight. The Ukulele Orchestra of Great Britain is, as its name would suggest, somewhat of a contradiction. Here we have eight supremely talented musicians, dressed to the nines in orchestral garb. And they’re playing ukuleles. Not only this, they are not playing your run-of-the-mill, surf-and-hula music. They open with ‘Born To Be Wild’ and from there, it just gets better. Playing nothing but their ukeleles (and singing along with some impressive harmonies), they belt out such gems including ‘Life on Mars’ (David Bowie), ‘Born This Way’ (Lady Gaga), the Shaft theme, ‘Smells Like Teen Spirit’ (which had more than one member of the band and audience head-banging in punkish euphoria), and most gloriously of all, ‘Teenage Dirtbag’ (Wheatus), which was dedicated to all the lady ukulele players in the audience. When you play this particular instrument, you’ve got to have a good sense of humour, which the Ukulele Orchestra of Great Britain evidently has in spades. Interspersing each inspired tune was a slice of witty banter; in appreciation for the applause after one song, one member was good enough to thank the audience “very much for the clap you’ve given us!”. No, thank you, for a marvellous way to spend an hour of our lives. 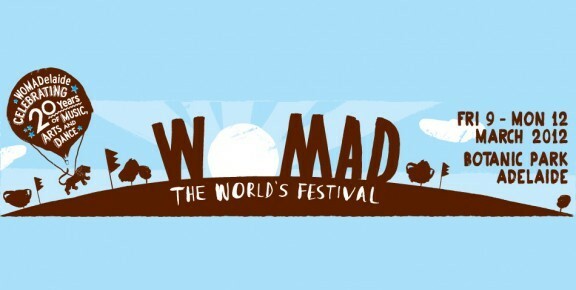 One of the many bright sparks of WOMAD is the workshops that are held with some of the bands. The Cambodian Space Project chose to run their workshop as a kind of behind-the-music exploration/band jam. The Project, who have played for both the King of Cambodia and Cambodian orphanages, as well as at an elephant’s 50th birthday party, aims to recreate the sounds of the golden age of Cambodian music that happened during the 60s and 70s (didn’t know there was one, or that there was a ‘Cambodian Elvis’, Sinn Sisamouth? Well, the Khmer Rouge didn’t take too kindly to musicians and artists, and under their regime the golden age ended, as was explained during the workshop). What they have created is a sound rich with world influences – traditional Cambodian, pop, rock, surf, go-go, and even a touch of Tex-Mex. Their vocalist is a native of Cambodia, who they found singing in a karaoke bar and who has learned what little English she has from her interactions with the band. After the songs they played, as part of the ‘workshop’ theme, a Cambodian/Adelaidean woman was there to translate the words of the songs and any words that the vocalist herself had in explanation. It almost didn’t seem necessary to translate the songs though, her intensely powerful, stunning voice really spoke more than just words could. Here’s a band to make you feel dissatisfied with your life’s achievements thus far: First Aid Kit is composed of two Swedish sisters, too young even to be born in the 80s. Another YouTube success story, First Aid Kit, were discovered after posting their cover of a Fleet Foxes song, and before you knew it, they were a support band for a Fleet Foxes gig in Holland. It’s no wonder, with their 70s inspired, folk/soft pop sound, that they would fit so perfectly alongside the Foxes. They have that heartbreaking, girl-next-door look about them (it’s only a theory at this point, but they may well be two lost Lisbon sisters from Jeffrey Eugenides’ The Virgin Suicides). A particularly sweet point was their homage to their favourite musical duets (“I’ll be your Emmylou and your June, and you’ll be my Gram and my Johnny too”). Certainly, there’d be no need for the first aid kit if these two girls were around; their beautiful harmonies would sooth any a woe. Now for something a little different: the Gramophone Man. Another of the charmingly unique features of WOMAD are the ‘roving’ artists, who move around the site, enticing those wanderers who haven’t been caught by a show on one of the main stages. The Gramophone Man features his own mobile set-up – like a lemonade stand, only with two gramophones, a stack of 78s, and a licence plate that reads “ABSINTHE”. He played the scratchy, glorious music of the 20s, 30s and 40s, which is overflowing with innuendo, often food-related. As he did so, he mimed the words and danced along – a real jack-of-all-trades. While the nature of his performance meant that the crowd he attracted was modest, he certainly left an impression – a baby girl being carried away to the next thing by her mother looked back in wonder and waved to the Gramophone Man. So WOMADelaide is about bringing a taste of the world to Adelaide. In this, it does a very good job. Yet Adelaide will still be Adelaide… What other city could you hold a major world music festival at, and find to your surprise (and immediate sense of importance-by-association) that your bass guitar teacher from high school is a guest musician playing with one of the bands? This is a real global village, right here. Don’t miss it next year. This entry was posted in Music and tagged blue king brown, eddi reader, festival review, picture box orchestra, the cambodian space project, the ukulele orchestra of great britain, womad, womadelaide. Bookmark the permalink.